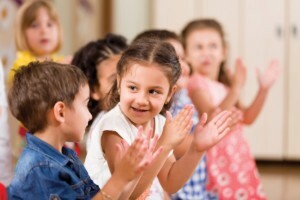 Does your little one love to sing or make up dances on their own? In I Got Rhythm, children will be inspired to be creative, interactive, and their silly selves! Students will develop social skills, while having a blast learning basic dance elements, playing movement and imagination sparking games, which all inspire healthy living. Students will also learn new ways to express themselves and gain coordination thru the infusion of objects such as rhythm sticks, scarves, and floor mats. It’s an exciting hour of expelling energy and having fun. Attire is comfortable. Shorts, leggings, sweatpants, t-shirt. Twelve student maximum per session – Ages three to five.